If you haven't heard all the debates about the kipping pull-up versus the strict pull-up, you should probably spend some time on the CrossFit.com message board doing a bit of homework. Searching for "kipping" or "kipping pull-up" will return many threads, but the granddaddy of them all is http://www.crossfit.com/cgi- bin/discus/discus.cgi?pg=prev&topic=22&page=9021. If you are already familiar with the debates, you undoubtedly know that the kipping pull-up is king. The question most beginners ask is, How can I learn to kip when I don't even have one pull-up? The answer is that it's possible to learn the movement with assistance. Often students who already have a number of strict pull-ups have the most trouble learning the kipping pull-up because it is necessary for them to break old, counterproductive habits first. I developed this teaching progression by teaching myself how to kip and then trying the movements with my clients at CrossFit Santa Cruz. The progression has been surprisingly successful with practically every student who has employed it. 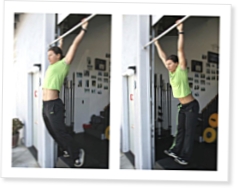 Mastering the kipping pull-up is not only fun but also incredibly functional and powerful, and it will take minutes off many of your Workout of the Day (WOD) times. are there assistance exercises to develop a stronger kip? In particular, for beginners? I thought maybe the knees to elbows exercise might help. Any ideas?